The role of fatty acids for archaeal physiology and metabolism has been mysterious for some time now. An informal collaboration between scientists from different institutes has provided new insights into how a model archaeon transcriptionally regulates genes encoding fatty acid metabolism. These insights bring us one step closer to understanding the biological role of fatty acids in archaea. It is typically observed that once a microbiological scientist becomes interested in archaea, this quickly turns into a fascination and he or she is unlikely to leave the research field of archaeal microbiology again. This fascination is driven by the unique lifestyles, physiological characteristics and metabolisms of archaeal microorganisms, which are often unlike anything found in bacteria and eukaryotes given their distinct phylogenetic position. Nevertheless, many archaeal biological processes are still understudied and poorly characterized leading to a limited knowledge framework. In addition, while for several archaeal model organisms cultivation methods and genetic technologies are available, these are often more challenging to implement as compared to methods developed for bacterial and eukaryotic model organisms. Consequently, the study of archaea requires scientists to develop a persistent and creative mindset. As one of those researchers with a fascination for archaea, I learned that, possibly due to this shared fascination and commonly faced challenges, researchers studying archaea have the tendency to easily interact with each other in a diverse and international research community that is typified by a very collaborative atmosphere. Each summer, this research community gathers for an archaea-specific conference, either the biyearly “Gordon Research Conference on Archaea"1 or the biyearly “Molecular Biology of Archaea” conference. My favorite archaeal model organism is Sulfolobus acidocaldarius, a thermoacidophile growing optimally at 75°C and pH 2-3. Sulfolobus species have been isolated from several terrestrial hot springs in volcanic environments in different geographic locations (see picture). They have been extensively studied not only because of their unique poly-extremophilic lifestyle, but also as a model system to reveal details on molecular biology or biochemistry that are relevant for all Crenarchaeota or even archaea. Throughout the years, I became interested in understanding the functioning of transcription factors in S. acidocaldarius. More specifically, I aim to understand how they enable the cells to sense and respond to stress conditions. Interestingly, while archaea harbor a simplified eukaryotic-like basal transcription machinery, their transcription factors share an ancestry with bacterial counterparts2. 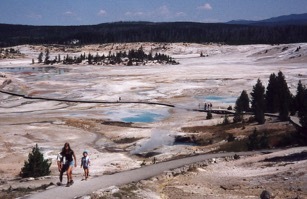 Figure: hot springs in Yellowstone National Park (United States), the natural habitat of Sulfolobus spp. (courtesy of Ann-Christin Lindås). In an attempt to understand how S. acidocaldarius responds to heat-shock stress, a relevant stress condition in the natural Sulfolobus habitat, I decided to focus on the study of transcription factors that are transcriptionally upregulated in response to a heat shock. One of those transcription factors was encoded by a gene numbered Saci_1107. On a conference in 2012, soon after initiating a study on the molecular mechanisms of the Saci_1107 transcription factor, I had an inspiring discussion with the late Rolf Bernander, one of the pioneering scientists in Sulfolobus research, especially with regard to cell division processes3. Rolf and his co-worker Ann-Christin Lindås were interested in unravelling cell cycle regulation by focusing on transcription factors of which the transcriptional profile shows a regulation in cell-cycle synchronized cell populations. During this discussion, we discovered that, because of the Saci_1107 transcriptional pattern being cell-cycle regulated, both Rolf and I were accidentally studying the same transcription factor but with a different motivation. We immediately decided to join forces and this marked the start of a fruitful collaboration between Rolf’s coworker Ann-Christin and myself. Ann-Christin and I used a variety of approaches -genetic, genomic, biochemical and structural- to unravel the regulatory role and molecular mechanisms of the transcription factor. Genome-wide chromatin immunoprecipitation and transcriptomic analyses demonstrated that, to our surprise, the regulator has a highly specific regulon, with the regulated genes’ functions not being linked to heat shock stress or cell division but instead to fatty acid and lipid metabolism, including several genes encoding b-oxidation enzymes. We discussed this intriguing finding with another archaeal scientist, Bettina Siebers, who is an expert in the study of metabolism4. She helped us to further unravel the physiological background and purpose of the regulation by the transcription factor, which we had named FadR in the meantime, among others by performing growth experiments. Fatty acids are essential elements of bacterial and eukaryotic membrane lipids but are absent in the archaeal membrane. The role of fatty acids in archaeal metabolism is still a mystery, especially since a phylogenomic study revealed that many archaea, and Sulfolobus spp. in particular, have an extensive repertoire of genes encoding typical bacterial-like enzymes involved in acyl-CoA metabolism such as beta-oxidation enzymes5. In this study, it was hypothesized that archaea might utilize a reverse beta-oxidation cycle for fatty acid synthesis5. By unravelling that the FadR transcription factor represses its target genes and that this repression is relieved upon interaction with acyl-CoA molecules, we were able to hypothesize that the FadR-regulated genes are, at least partially, not involved in the synthesis but instead in the degradation of fatty acids. When looking at the picture of the Yellowstone National Park environment, one could imagine that fatty acids are derived from plant material falling into the acidic hot springs and decomposing because of the hot acidic conditions. Our study is a nice demonstration of how the understanding of gene regulation can provide hints about the metabolism or physiology of a microorganism and the link with its natural habitat. But even more so, this paper is a perfect example of how an informal collaboration, which has grown organically and was mainly led by serendipity, can lead to new scientific insights. I therefore end this blog post with a plea for the importance of an open attitude towards discussing science, not only within the community of archaeal scientists, but in the entire scientific community. 2Bell, S.D. & Jackson (2001). Mechanism and regulation of transcription in archaea. Current Opinion in Microbiology, 4(2), 208-213. 3Ettema, T.J., Lindås, A.C., Hjort, K., Poplawski, A.B., Kaessmann, H., Grogan, D.W., Kelman, Z., Andersson, A.F., Pelve, E.A., Lundgren, M., Svärd, S.G. (2014). Rolf Bernander (1956-2014): pioneer of the archaeal cell cycle. Molecular Microbiology, 92(5), 903-909. 4 Bräsen, C., Esser, D., Rauch, B. & Siebers, B. (2014). Carbohydrate metabolism in Archaea: current insights into unusual enzymes and pathways and their regulation. Microbiology and Molecular Biology Reviews, 78(1), 176-197. 5 Dibrova, D.V., Galperin, M.Y. & Mulkidjanian, A.Y. (2014). Phylogenomic reconstruction of archaeal fatty acid metabolism. Environmental Microbiology, 16, 907-918.